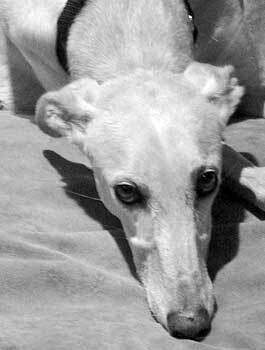 Mickey is an approximately 3-4 year old champagne fawn non-tattooed male greyhound. 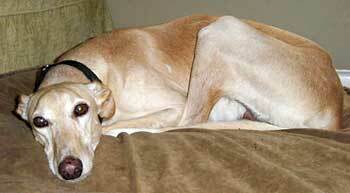 Mickey was found as a stray in the Grand Prairie area, wandering the streets with no identification or collar. He is in very good condition for a stray, and needs to find his forever home! He is very, very sweet and loving and really likes to be with people! Mickey is small animal and cat tolerant. Mickey is such a fascinating and sweet little boy. 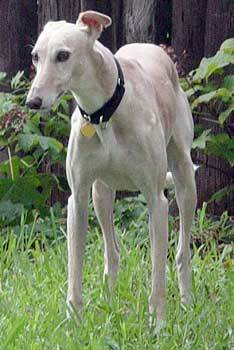 His coat is the most perfect fawn color and he has a beautiful white tip on his tail. His small and gentle stature is the perfect body for his gentle spirit. Since the first day we invited him into our home he has been so loving and compassionate. He will sit with you for an hour, repeatedly moving his head under your hand, provoking continued petting. He is devoted to his daily yoga practice, most often practicing his "downward dog" position for long periods of time. He enjoys other forms of exercise also. Mickey loves to go on walks and does very well on a leash. He also really enjoys running and playing with my greyhound in the backyard. He is a joy to watch in the backyard because is so agile and flexible. Mickey truly loves life. He has encouraged me to slow down and enjoy the moments that I share with him. Mickey is housebroken and has had no accidents to date. He also prefers not to be crated; we currently give him the run of the kitchen during the work day.